I need to give a shout-out to my favorite beauty product of all time! Laura Mercier Secret Camouflage can’t be beat–it completely covers dark circles, blemishes, neutralizes redness and lasts all day. Two shades per compact lets you customize your color for a perfect match every time. Even when I’m having a “makeup-free” day, I use this to even out my skin-tone–a little under the eyes (always layered on top of eye cream) and around the nose area (where I’m prone to a bit of redness) and I can face the day. When wearing foundation, apply the concealer afterwards to see where you really need it. A little goes a long way and one compact will last you a very long time. Mine lasts 6 – 9 months and I wear it every day! 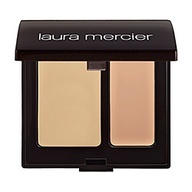 Laura Mercier Secret Camouflage, $30 at www.lauramericer.com.